It got pretty cold out last night so I didn't want to get up and leave my warm sleeping bag, so it was a little bit of slow morning. 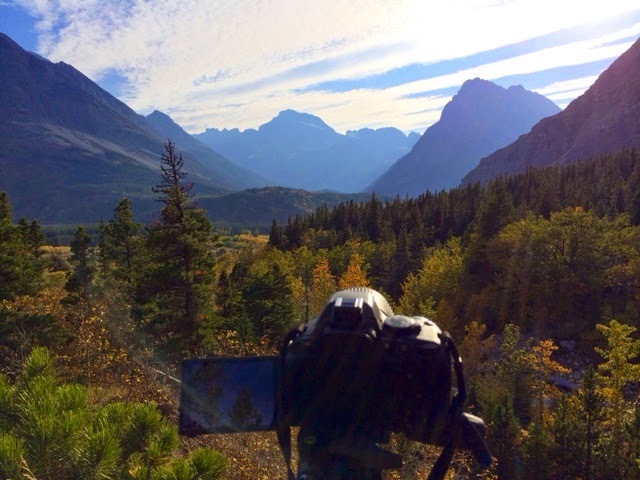 I drove back in to Glacier NP and did some hiking around Medicine Lake. 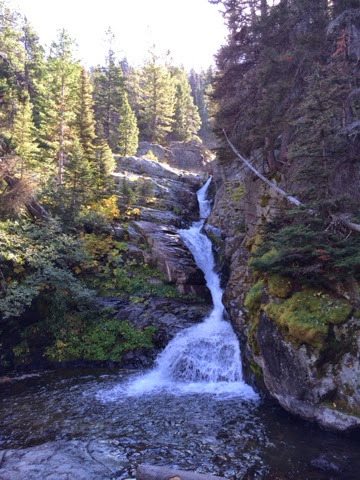 I had a break at Aster Falls, I found some nice rocks to sit on right next to the falls and overlooking the mountains. I spend about 2 hours there and since I had brought my Ipad, I was able to type some blog posts. The weather was sunny once again and by 10am it had already gotten warm enough to only wear a t-shirt. I had lunch at the lake and spend the afternoon exploring the 'many glacier" area of the park. Some clouds had stated to move in by the afternoon so I was able to do some timelapse photography. 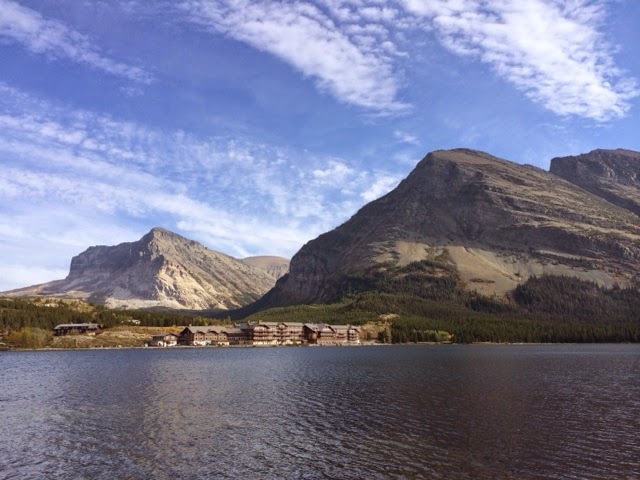 I spend the night in East Glacier at the Brownies hostel. It was nice to take a shower again! I woke up early and checked out of the hostel. It was only $17.50 to stay in the dorm thanks to my Hosteling International membership, making it the cheapest hostel so far. 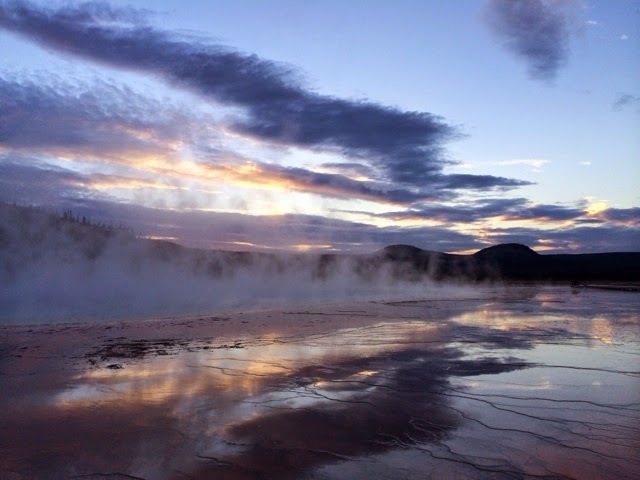 I mainly did a lot of driving today to get to Yellowstone National Park. Most of Montana is hills with grass so it was kind of a boring drive. The speed limit is really high here though, even on winding roads with potholes and cows on them, it was still 70mph. You have to be really careful, twice I got stuck in a herd of 100+ cows that ranchers where trying to move through the road. 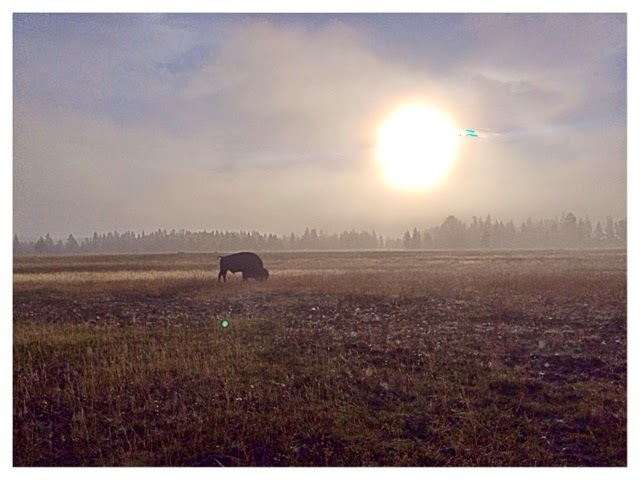 I stopped on my way for lunch and supplies in Helena and made it to Yellowstone late afternoon. Almost right after entering the park I spotted some Elk walking in the river. 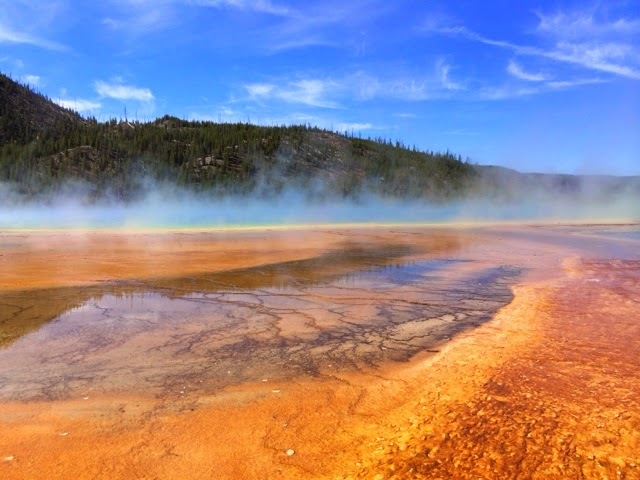 I stopped and took some pictures and then drove to the Grand Prismatic Spring. I got there just in time to catch the last of the sunset. I took some pictures and did a quick timelapse. It was super beautiful! I found a good spot to car camp and shortly after it had gotten completely dark I could hear the Wolf's howl. It was a great sound to fall asleep to! I woke up at sunrise but it was very foggy out so you could't even see the sun. The cool thing about the fog though was that I was able to take pictures of the Bizon with nothing but fog around them. It took about 3 hours to clear up and the rest of the day was sunny. 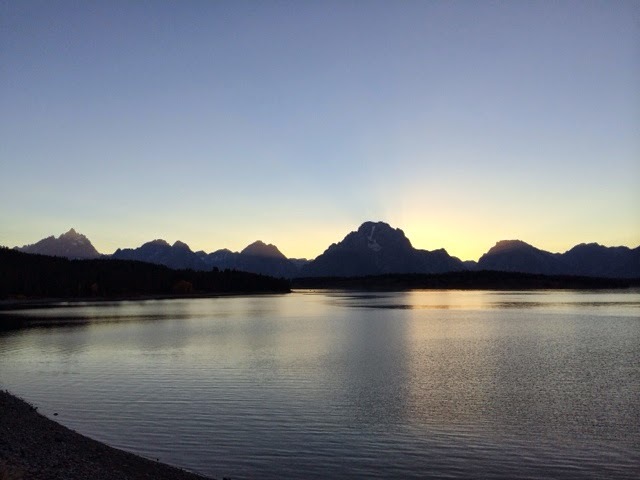 I spend the morning exploring more of Yellowstone but since I had been here before and only driven through the Grand Tetons, I decided to drive there in the afternoon so I could spend one more day exploring Grand Teton National Park. I got there in the late afternoon and was able to watch the sunset and take some nighttime pictures from the top of Signal Mountain, where I also camped.